California's Santa Maria Valley is home to what has been called, by some, the best barbecue in the world. 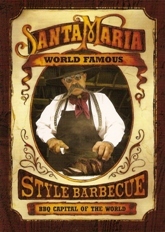 The Valley's Visitor Information site has produced a booklet featuring all you need to know about the Santa Maria Valley barbecue scene. In addition to showcasing the rich history of Santa Maria Style Barbecue, the 14-page booklet features a list of restaurants and caterers specializing in the regional culinary tradition. The booklet also contains recipes for Santa Maria Style Pinquito Beans and Santa Maria Style Barbecue Salsa, as well as pairing suggestions from 12 local wineries. You can send off for it and wait for the mailman to bring it, or you can download the PDF file and get that immediate gratification for which the internet age is famous. If you'd just like to see which Central Coast wines are recommended to pair with SMV BBQ, here is that excerpt directly from the brochure.